Modern cars utilize state-of-the-art technologies and devices. They also feature the traditional mechanical and engine parts and components. Today’s cars use information from the computer to identify problems. For instance, the warning light, brake light, or engine light lights up when the computer detects a problem. This is why car computer scanning is gaining importance. This alerts the driver and makes it easier to figure out what/where the problem is. Hence, maintaining the computer of your car is important for all owners. Either you can opt for professional computer car scanning or pay for a diagnostic tool. These tools come with helpful software and instruction booklets. With regular car computer scanning, you can rest assured all problems will be taken care of. Your mechanic will use a diagnostics tool to check for problems in the powertrain control module (PCM). If any problem codes show up, the mechanic will interpret them and detect the major/minor malfunction. This means your car will be back to perfect order in no time. Expert mechanics use scanning tools that feature a module with a screen. Once they plug in the unit, they can assess the mechanical condition of the components, accessories, and vital engine parts of your car. With regular professional car computer scanning, you can nip any problems your car faces in the bud. Thus, your car will undergo repair immediately, before the problem worsens and leads to an even bigger problem for you. Car computer scanning goes beyond detecting issues with your car’s mechanics. It will also detect inefficiencies and irregularities with the electronics, which include the lighting systems, audio systems, air conditioning systems, and even the ignition. Moreover, computer scanning detects problems and alerts drivers of problems before they become serious. 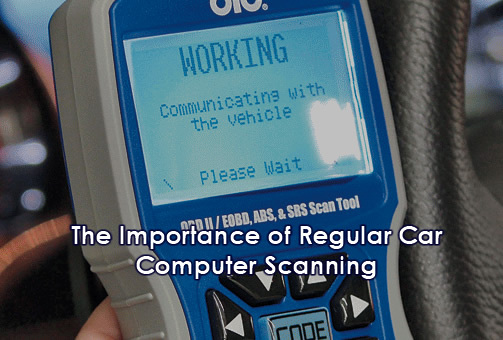 In fact, the scan will pinpoint the root cause of a potential issue in the electronics of your automobile. Regular car computer scanning will ensure your car remains good as new. Ensuring long-term performance is the key to getting the best bang for your buck.